One of the marquee games in the state this weekend features No. 1 Mill Valley hosting No. 2 St. Thomas Aquinas in one Class 5A semifinal. The two teams met in the season opener where Mill Valley forced three Aquinas turnovers and topped the Saints 38-20. Since then, Mill Valley continued to send a message to the rest of the state by posting wins over Blue Valley Northwest, 6A semifinalist Derby, St. James Academy, and Bonner Springs. The Jaguars one loss came 28-21 to Staley (Mo. ), a team that ascended to No. 1 in the Missouri Class 5 rankings before completing a 9-2 season with a loss in the state quarterfinals. In the playoffs, Mill Valley shutout Leavenworth 49-0 before blowing past Pittsburg 56-21 in last week’s quarterfinal. In the Pittsburg game, Christian Jegen rushed for 170 yards and four touchdowns and caught five passes for 103 yards and three more scores. Quarterback Logan Koch passed for 148 yards and three touchdowns and added 51 yards on the ground for the Jaguars. For the season, Koch has passed for 1,992 yards and 28 touchdowns with only five interceptions. He’s also added 632 rushing yards and nine scores. Jegen has rushed for 596 yards and 12 touchdowns, and caught 55 passes for 1,044 yards and 14 more scores. The Jaguars feature a big offensive line with tackles Ben Hecht (6-6, 250) and Tanner Jenkins (6-7, 280). The Mill Valley defense is led by Seth Burnett (98 tackles) and Cole Morris (69 tackles, 24 tackles for loss, 9 sacks). 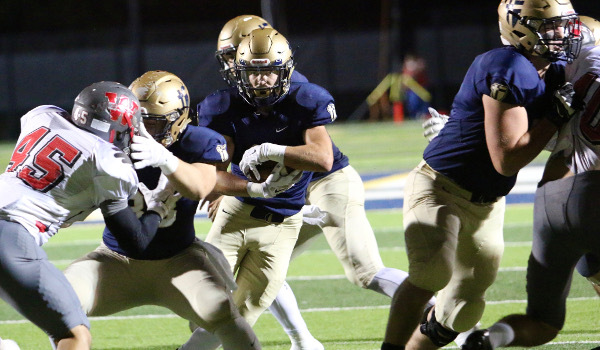 After the loss to Mill Valley to open the season, St. Thomas Aquinas picked up quality wins over 6A playoff teams in Blue Valley North and Blue Valley Northwest by the identical score of 42-13. The Saints then lost 41-21 at Bishop Miege before winning their next six contests. That six-game win streak included a 35-13 win at 6A semifinalist Blue Valley in which the Saints dominated in the second half. The Saints have averaged just shy of 40 points per game while giving up 15 per game. Aquinas averages 363 rushing yards per game and surrenders less than 100. Aquinas features a balanced rushing attack led by senior James Cosentino’s 846 yards and 11 touchdowns. Cosentino missed the earlier meeting with Mill Valley recovering from an injury. Five other backs have rushed for at or more than 500 yards on the season including, Sam Ramaekers (638 yards, 6 TD), Karter Odermann (619, 18 TD), Jacob Leikam (595, 5 TD), Duron Lowe (504, 7 TD), and Sam Budetti (498, 3 TD). Odermann has passed for 611 yards and seven scores on the season. Both teams like to run the ball, but Mill Valley is more balanced with the abilities of Koch and Jegen. In the first meeting, the Jaguars led 14-12 at halftime before using a 14-0 third quarter to gain some separation. Aquinas rushed for 293 yards in the first meeting and averaged more than five yards per carry. The Saints were hurt by three turnovers, while Mill Valley did not commit a turnover. Aquinas will have to contain Koch and Jegen if they want to have a chance to win, but opponents have found that a difficult task all season. Goddard-Eisenhower has emerged as the biggest surprise in the state playoffs, regardless of classification. The Tigers, big underdogs in both contests, collected road victories versus Kapaun Mount Carmel (20-14) and Maize South (16-0). Statistically, the Tigers are a 29-point underdog to Bishop Carroll at home Friday. Eisenhower, in its fourth season of existence, stood at 5-22 all-time entering this season. The Tigers are 0-2 all-time against Carroll. Junior Mason Madzey leads the offense. The offensive line has permitted just two sacks all year, and fullback Joseph Weibel is the program’s first 1,000-yard rusher. Carroll lost, 31-24, to eventual City League champion Wichita Northwest in the season opener. Since then, the defending state champions have won 10 straight. Carroll has two state championships and lost just two contests since the start of the 2012 season. Since the loss, Carroll has tallied at least 31 points in every contest, save a rain-drenched 20-0 victory against Valley Center in Week 9. Carroll has won every game by at least 17 points, including a 44-14 victory versus Heights last week, the second victory versus the Falcons this season. That includes a 47-7 victory against rival Kapaun in Week 3. The Golden Eagles are in their eighth semifinal in 10 years. Carroll has battled through several injuries, namely to captains Will Honas, Chris Dugan and quarterback Jake Allen. Honas and Dugan are done for the year with knee injuries. Allen suffered a concussion in a first-round playoff victory. Offensive lineman Noah Johnson is the only healthy captain. Backup quarterback Cannon Lynch stepped in and played well before suffering a broken leg early in last week’s win. Third-stringer Braden Howell, a sophomore, and starting running back Adam Theis guided the offense to the Heights win. Howell, the younger brother of Carroll’s 2014 all-state quarterback Colton Howell, entered in the game and rushed for 151 rushing yards and two scores. Theis collected 167 yards and a pair of touchdowns for the Eagles. Eisenhower’s run is going to be remembered for a long time, but this will be one of the all-time great upsets if the Tigers can win on Friday. Eisenhower has done a great job of winning “on the margins” with turnover margin and special teams in the playoffs. The defense, especially against the pass, has been exceptional. The key is whether Eisenhower can score Carroll on the ground, win special teams and turnover margin. Carroll runs effectively and does enough to win.